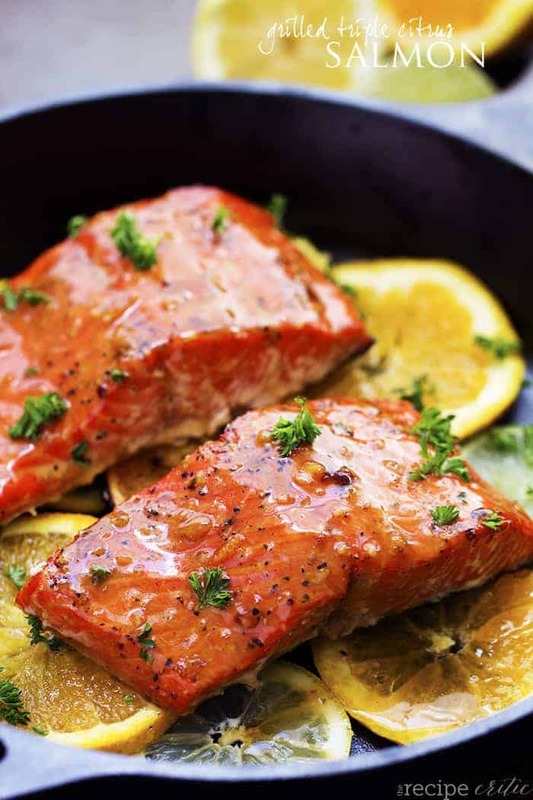 A five star salmon recipe that gets infused with a lemon, lime and orange marinade. It grills to tender and flaky perfection and has the best sweet and tangy flavor! This recipe today is so simple and the marinade is so easy to make. I am going to give you some tips on how I grill the best salmon every single time. Salmon can be tricky at times to grill. 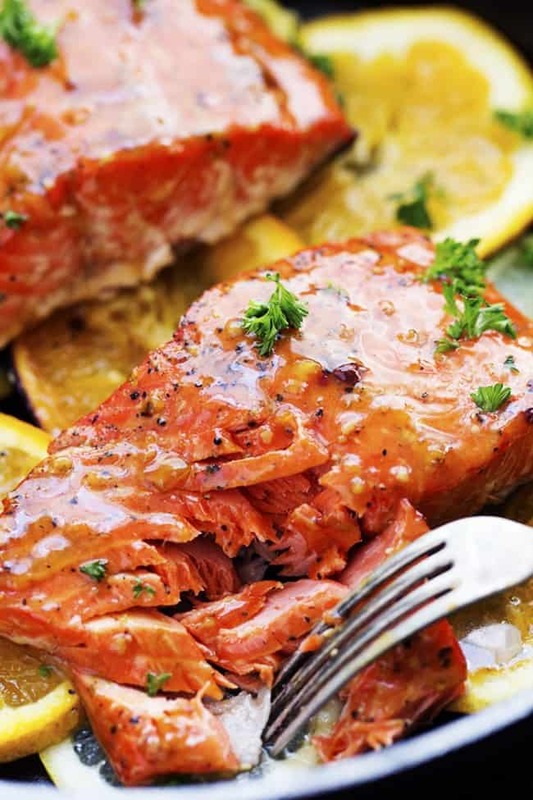 But you will amaze yourself at how you can bring a restaurant quality salmon to the dinner table. Soak your cedar planks for 1-2 hours before grilling. Heat the grill to medium low heat and lay the planks on the grill. 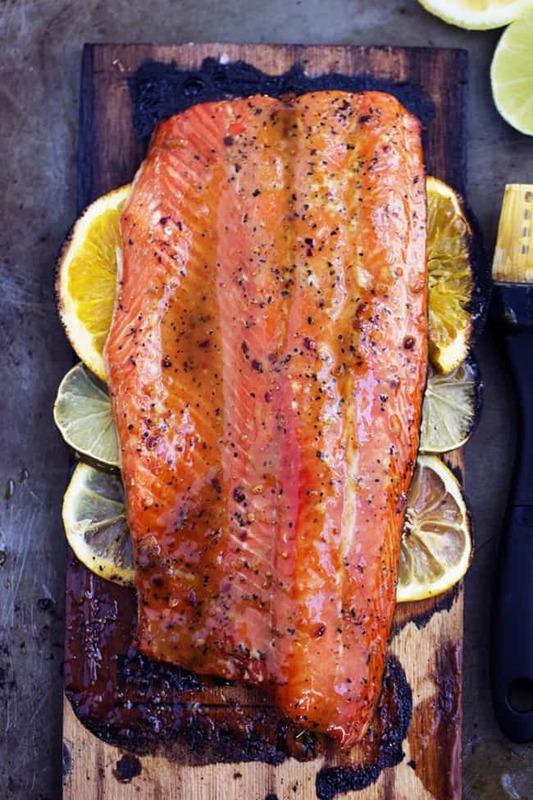 Lay the salmon on top of the cedar plank skin side down. Shut the grill and allow to cook for 12-15 minutes. This is my favorite part because the grill fills up with smoke and gives the salmon amazing flavor! 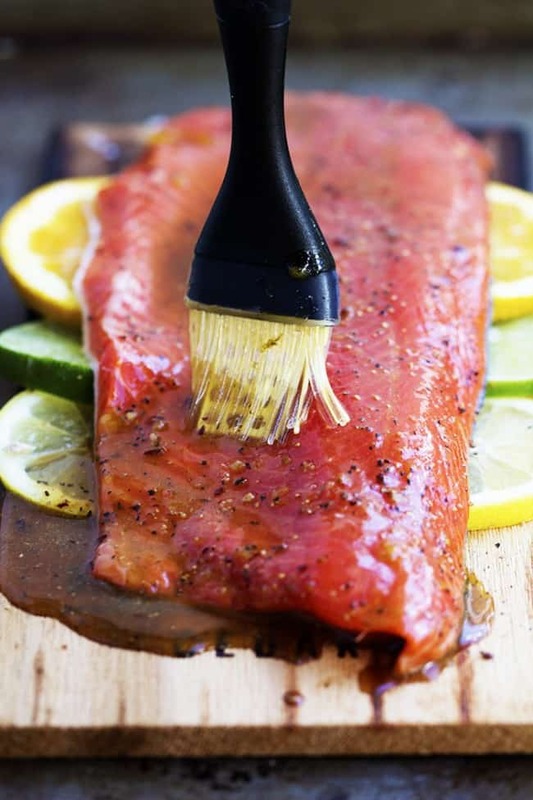 When the salmon is done, transfer to a baking sheet and gently use a spatula and remove the skin from the salmon and serve. This triple citrus glaze is absolutely incredible. Lemon, lime, and orange fuses together to bring a sweet and tangy marinade. It is the perfect summer marinade in my opinion. I used a sockeye salmon and I love the bright red color and flavor. I added some slices of lemon, lime, and orange on the sides of the salmon as it grilled. After only about 12 minutes, I had a gorgeous salmon just begging for me to eat it. The plank gives it such an amazing presentation and it grills in the marinade and keeps the flavor as it grills. The result is out of this world! I love that I have found Fire & Flavor and their products to help make grilling easier. 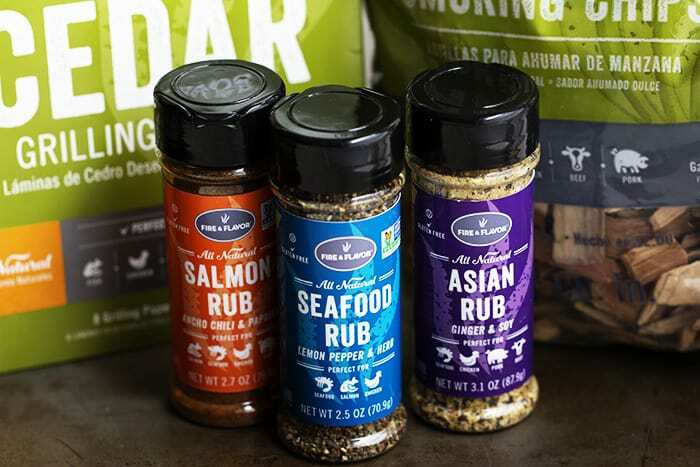 They have so many great products and I especially love their rubs. I can simply rub them onto what I am grilling and have a flavorful meal ready in no time at all. They also have flavored smoking chips and cedar grilling paper. You are sure to impress your family with all of their easy to use products. This salmon recipe is incredible and I promise that it will be one of the best things that you grill this summer. I instantly fell in love with my first bite. I couldn’t believe the amazing flavor of this salmon and I couldn’t get enough. I know that you are going to love it just as much as our family did. It is perfect for summer and will become a family favorite! Transfer the salmon to plates and brush with reserved salmon on top. Enjoy! I am working with The Salmon Council and this post has been sponsored. All opinions expressed are my own! Loving the flavors here, looks absolutely awesome!! Your foreword mentions heating the grill to medium low, laying salmon on grill, then shutting grill cooking salmon for 12-15 mins. However, the recipe says to cook salmon 12-15 mins on med-high heat for 12 to 15 mins. OH thanks for catching that. It is medium high heat. The shots of this salmon are incredible! 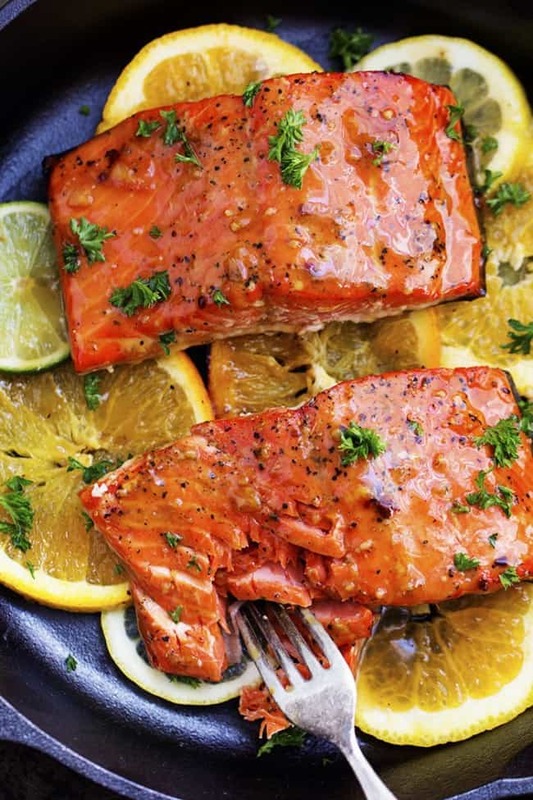 You really have captured all that delicious citrus-y flavour & I love how glazed the salmon looks. Yum. look so delicious. Will give it a try. I believe the #4 is off somewhat…”brush with reserved salmon.” Possibly “reserved marinade” I’m guessing. They are right, this looks really delicious!! I will try this and hopefully soon. The recipe calls for brown sugar but I don’t see it in the instructions below?? I have never baked it or seared the salmon. That is a great idea! I think it would still tastes about the same if it isn’t overcooked. If you try it out, let me know how it turns out! I’m going to try to grill it if I can find a plank (any suggestions?) – also, did you cook this as one 24oz piece or 4 6oz pieces? Does it make a difference? Never grilled salmon before! BTW I did not bake, I followed your directions and it was AMAZING! I served it with grilled fennel over whole wheat egg noodles and kale. I would use this marinade for basically anything! Thanks for the recipe. Trying to print out your salmon recipes and it won’t show anything to print?? ?